Bendis’s Superman and Spencer’s Spider-Man were both met with pretty positive turnout as both books took the top two spots in our FFF weekly Top Ten. Both big name creators made their mark on these debut issues of cornerstone characters. Man of Steel sold well, but the big #1 (and two variant covers) made for a successful first issue. Die Die Die should’ve sold more even if it was our third best seller. Kirkman dropping a book with two big name collaborators without warning was a surprise to be sure, but it would’ve been more welcome if we the retailers had actually had at least a day to prep and figure out how to market it. Of Kirkman’s three books on the shelf right now, our subs list barely has any overlap. Sure, some people will read anything he puts out, but a preview of some kind would’ve been helpful. All that is to say I didn’t massively appreciate the gesture. While it didn’t have the first week it deserved, I know it’ll be one of those books that will sell well off the shelf for many more weeks to come. Farmhand also came out to positive reviews, taking the #9 spot in our Top Ten. Chew fans stuck with it and some new readers also got drawn in by the crazy art and crazier premise. Batman #50 was our sixth bestseller this week showing that the outrage over the issue hasn’t really done our readership any damage, though I understand why the stores who dropped a pretty penny to get exclusive covers are upset. The controversy got people in stores and we even had a few people set up folders to start pulling the bat book. Bendis has Came and Conquered! Super-man edged Spider-man out by a hair this week, but the Wall Crawler’s sales were nothing to balk at. Those displeased with Dan Slott were quick to jump right back in and give the book a shot with the new status quo shift. Die! Die! Die! debuting at the #3 slot is an impressive feat with literally no reveal that the book was even coming out. Flash and Wonder Woman both hit the list with their milestone #50s, particularly the Mattina and Frisson variants. X-23 out of the Wolverine costume seems to have outsold all the most recent issues of All New Wolverine by a wide margin. Titans roped in a few more new subscribers than previous issues. Robert Kirkman and Chris Burnham’s surprise drop didn’t quite propel DIE! DIE! DIE! #1 to the top of our bestseller list, but it sure came close. It was runner-up right behind the return of the LEAGUE OF EXTRAORDINARY GENTLEMEN. It was close, but, ultimately, Alan Moore and Kevin O’Neill couldn’t be beat. Pretty good week for Marvel, as AMAZING SPIDER-MAN #1 unsurprisingly takes the top spot. X-23 #1 also showed up to do some work, rounding off the end of the top half of the list. DC answered Marvel’s #1’s with a #1 of their own: Brian Bendis’ SUPERMAN #1 performed solidly. DC also had a couple milestone issue #50s: both FLASH and WONDER WOMAN’S Rebirth titles hit their half-centennial still selling well. Somewhat surprisingly, HAWKMAN is still hanging in there with it’s second issue keeping up momentum. The rest of the list is mostly usual suspects, with the obligatory Bat-title clocking in the top 5. Of particular note of what’s NOT on the list: Kirkman’s big “Beyonce” move with DIE! DIE! DIE! didn’t have much of a splash at our store. Perhaps the numbers will pick up a bit as word spreads. Wow, slow week. 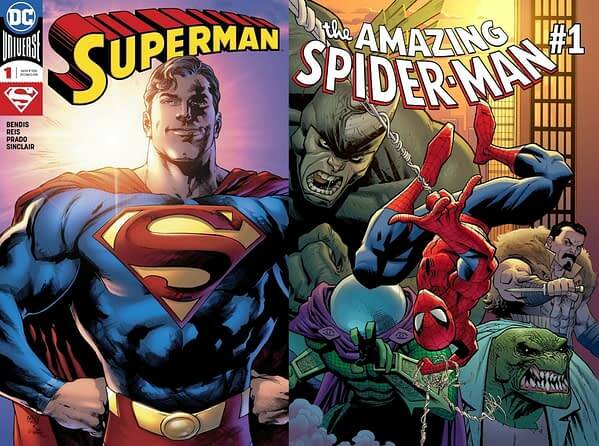 Amazing Spider-Man #1 and Superman #1 did not do well for first issues. Amazing Spider for us has lost most of its popularity it had gained with the Red Goblin storyline it looks like. Marvel did get four titles in our top ten this week. Flash 50 took the top spot for us. Hopefully next week things pick back up again. DC takes six slots in our top ten (including first place, which was a neck and neck race between Superman and Amazing Spider-Man up to the very end of business), Marvel tales three, and Image takes one with DieDieDie #1, the book that no one expected. We’re seeing more excitement from readers every week; apparently good storytelling is the secret to good sales! The surprise book, Die!Die!Die!, by Kirkman sold really well despite no solicitations – nothing about this book was known to us or our readers. New Mutants #87 9.0 $190 Very Sharp Signature Series CGC 9.0 first Cable signed by Liefield parted our store a little earlier in the week. X-Men #14 gd/vg $75 That’s a cool cover, and who knows, maybe we’ll get a proper visual representation on the big screen someday.